This page outlines some of the programs offered by The Photo Palace Bus, which aim to make the experience of analog photography fun and accessible for all audiences. A regular offering to all those who step aboard The Photo Palace Bus. Vintage and modern prints are displayed in a chronological line-up illustrating the major developments in the history of photography. After a brief explanation of main milestones in evolution of image-creation, questions are welcomed and physical interaction with prints is welcomed. The Photo Palace Bus is happy to present opportunities for experiencing this beautiful and challenging mid-19th century process. 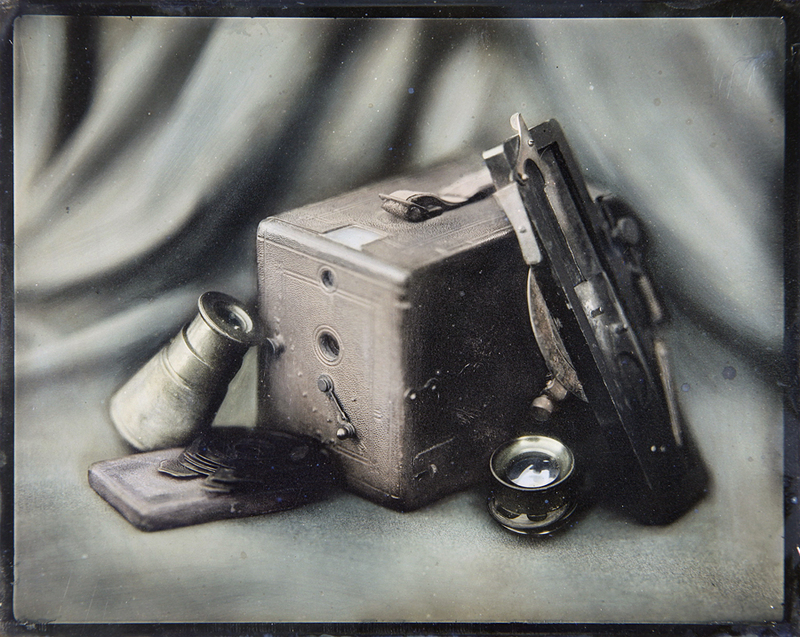 With this original instant photography technique, a picture is produced on glass or metal and is available for viewing within minutes of exposure. A perfect way to see photographic chemistry in action right before your eyes. 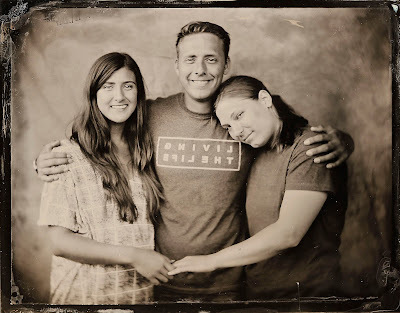 Wet plate programs include beginning and advanced workshops in both positive and negative processes, simplified tintype experience, and portrait sessions. • Workshops range from beginning to advanced and can be scheduled for one to four students at a time. Beginning workshops are aimed to give each student plenty of practice until they feel truly comfortable with the process. Advanced workshops focus on each individual practitioner's need and can focus on topics such as negative-making and advanced positive techniques. • Tintype Experience is a simplified version of a workshop. After a brief lecture about the process and a demonstration, each participant makes one plate from start to finish. With 4 students 3-3.5hr is usually sufficient, so up to two groups can be scheduled in one day. • Portrait sessions for individuals and groups are also welcome. Photo Palace us can convert into a studio in a blink of an eye, or portraits can be created in your favorite location. Requirements - no extra requirements are needed other than a shady place to park (wet plate chemistry can act very oddly when it gets hot and so can the workshop participants). Daguerreotype was the first, and many have proclaimed most noble, photographic technique. Images made with this method, which was introduced in 1839, never fail to awe and inspire those who hold one in their hand. Each image is created on a plate with a layer of pure silver and is entirely unique. Workshops (in both Becquerel and traditional Hg methods) for 1-3 participants as well as portrait sessions can be scheduled. This special offering is sure to excite any audience. Magic Lantern has been a prominent medium of communication for over 300 years. Its uses are both entertaining and educational in nature. Images are projected from vintage glass slides and are spectacular to view. The first part of the show is an introduction to the nature of the Magic Lantern and its applications. Audiences are familiarized with various types of the Magic Lantern slides and their historic uses. 19th century slip-slides, travel views, scientific slides and even chromatropes are displayed via a beautiful 1917 Bausch & Lomb Lantern. The second part of the show consists of a unique slide show using photography of John Wells Rahill. When in 1917 Rahill went to Russia to work with the troops during the First World War he took with him a simple Kodak Jr. #1 camera. His incredible journey undertaken almost 100 years ago is spectacularly documented with a set of slides that were made upon his return. Requirements - a darkened room that can hold an audience of the size that your organization can anticipate. Large projection screen is preferred but not required. Requirements - no extra requirements, though if you plan on hosting this event during the hot period of the year it is good to schedule it later in the afternoon or to have a shaded spot for The Bus to park. Designed for up to 4 participants this intimate workshop is an introduction to manual darkroom printing technique. Students will have a chance to develop their own film and print images in 8x10 format. The workshop is held on board of The Photo Palace Bus and lasts 4-6 hours and will ensure that someone with a home-made darkroom has the proper amount of knowledge to produce their own gelatin silver prints. All the equipment except for cameras is provided. Requirements - If you would like to schedule this during the hot part of the year please schedule this in the afternoon or have a well-shaded space for The Bus - we want to provide a pleasant experience for those involved.